From specification to quick ship inventories, we can help you find the right caster for your application. When it comes to high-stress, heavy caster needs, we can come to your facility and help you meet your needs. Fabricators often use our expertise to help them win cart and hauling device business, while other companies utilize us for fast, reliable RWM replacement casters and wheels. 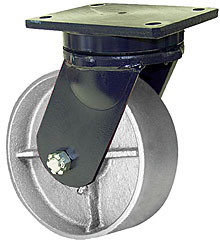 We stock RWM casters in Texas, including the original Kingpinless swivel caster and a broad variety of wheels. More importantly: if you require specification assistance, our experts are on call and ready to help. Hamilton manufactures casters and heavy-duty carts in the United States. Cisco-Eagle stocks a broad variety of heavy-duty wheels in Texas. We can help you with everything from cast iron, to phenolic, to urethane and plastic wheels for every application. Do you need application assistance? We're here to help.